What Is Black Skull Bone Crusher? The new Black Skull Bone Crusher by Top Mr. Olympia IFFBB Pro Eduardo Correa make you get the shivers down your spine. 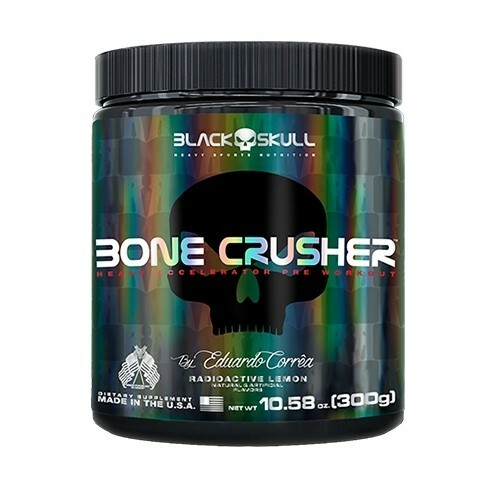 Developed with unique ingredients that have been carefully formulated to enhance and intensify the quality of your training, the new Bone Crusher became the next level of pre-workout products. Bone Crusher brings a ultra-concentrated formula designed to provide explosive energy, focus, strength and maximum performance. You will have surprising levels of vascularization, energy and a pump that you could never reach before. Leave your old pre-workout back, hold on tight and get ready for the new era of Black Skull Bone Crusher. How Do I Take Black Skull Bone Crusher? Mix one level scoop of Black Skull Bone Crusher with 5-6 oz. of cold water before training. Manufactured in a facility that processes milk, eggs, fish/.crustaceans, shellfish, tree nuts, peanuts, wheat and soy. Do not purchase if safety seal is broken or missing. Store container between 15'C to 25'C (59'F to 77'F) in a cool, dry place.